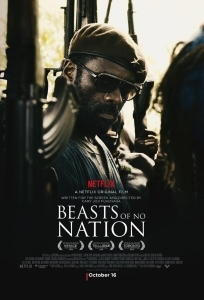 There’s a scene halfway through Cary Fukunaga’s adaptation of Uzodinma Iweala’s harrowing novel Beasts of No Nation (2015) – currently in select cinemas and on Netflix from 16 October – where a mother and her daughter are dragged from their hiding places, raped and killed while our protagonist Agu (a stunning performance from Abraham Attah) participates. It’s a brutal moment in a film full of them and represents an ulterior and final loss of innocence. And yet such notions of innocence and guilt, of victim and oppressor, are not strictly delineated and darkness and confusion reign in the moral fog of war. We first meet Agu as a carefree young village boy, trying to scam money off the local Nigerian peace keeping soldiers by selling them an “imagination television” – basically the filched box of the TV frame in which Agu and his friends can play different programmes. We know Agu is happy because he is free to be a rascal, teasing his older brother (Francis Weddey), irritating his father, the local schoolteacher father (Kobina Amissah Sam), and adoring his mother (Ama K. Abebrese). However, everything is to change as the unnamed African country descends into chaos and that blood soaked oxymoron – civil war. The crisis is overheard on the radio and in a village meeting. A plague of abbreviations (NDF, PFA) are tearing up the country as the government seizes power and bans all political parties. The family is broken up as mum and her baby daughter are stowed in an overloaded taxi and the men left behind must shift for themselves as the tanks roll in and anyone not belonging to one side, risks being shot by both. Having escaped one blood bath, alone and terrified Agu wanders the bush. Fukunaga’s genre chops come into play as the boy’s trip through the jungle becomes beautiful dark and terrifying. Noises off threaten a constant danger and soon enough he is snaffled by a group of warriors, fighting for the Commandant (Idris Elba). Having already headlined as one kind of charismatic leader in Mandela: Long Walk to Freedom (2014), Elba now uses his expansive charm and his wit to show us the diabolical inversion. The Commandant leads his young charges as a surrogate father, strict and strong willed, but insisting on their devotion and loyalty. He will urge them on to murder and massacre while at the same time keeping an eye out for choice items of pillage. He will use emotional blackmail and lies, and abuse, as well as a kind of voodoo magic, insisting they will be magically invisible to the enemy. The parody of military discipline – a repeated call of response “How does the Commandant look?”, “He looks alright” – and the trappings of a western military tradition is as arbitrary and false as Agu and his friends playing in their imaginary TV, but this kind of play, this kind of imagining, murders thousand. Agu befriends a mute child soldier Strika (Emmanuel Nii Adom Quaye) and with the rest of the squad friendships develop. Drugs are taken to facilitate the murdering and, in a beguiling sequence, the jungle turns purple as the troop attacks. Visually, Fukunaga makes the beauty of the surroundings a counterpoint to the ugliness of what men are doing there. As the Commandant is called to a meeting with the Supremo (Jude Akuwudike), it’s obvious that his power is on the wane and the troop soon finds itself on the point of breaking up. Having portrayed the descent into hell so effectively, there’s almost no place for Fukunaga to go. No resolution can truly compensate and redeem what we have already seen. Things fall apart, you might say. Fukunaga and his actors – especially the two leads – have managed to create a riveting drama which is suitably appalling.